No Seat Belts Required: Drone Hobbyists Talk Safety : All Tech Considered The hobby has grown rapidly over the last few years, as technology has gotten cheaper and the open source software has been smoothed out by many users. 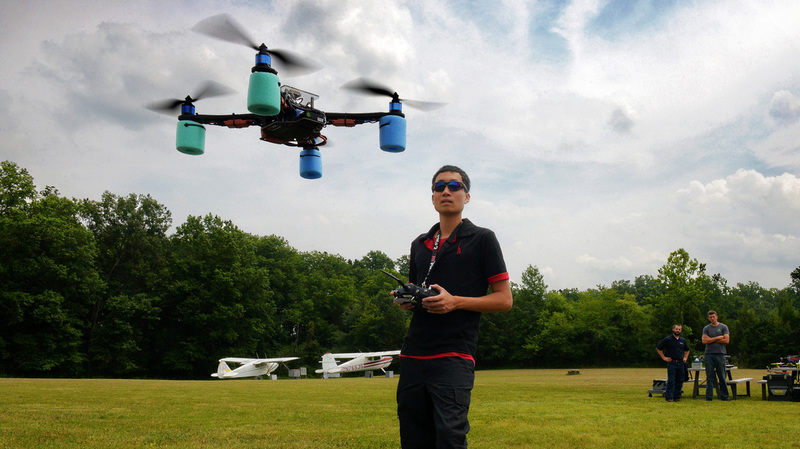 Christopher Vo pilots his aircraft as local drone enthusiasts gather for a Maryland fly-in at an airport in Laytonsville, Md. Last month, I got hit by a drone. No, it was not a giant surveillance robot, or a sinister armed device. It was a cute little quadcopter about the size of a coconut, operated by a professor who built it for fun. A flying device capable of autonomous flight, often equipped with a camera. Scientific American has explored the topic in detail. Synonyms: Unmanned Aerial Vehicle (UAV), Unmanned Aerial System (UAS). The hobby of building and flying drones has grown rapidly over the last few years, as technology has gotten cheaper and open source autopilot software has been smoothed out by thousands of users. With such rapid growth comes the growing pain that most nascent hobbies run into — when to come up with rules. Recent incidents — on scales much larger than the little drone hitting me in the shoulder — have gotten amateur drone users thinking more about safety.
" ... an out-of-control or lost aircraft can ... be transformed into a lethal, flying object falling from the sky at near terminal velocity." To my knowledge, that hasn't happened yet. But there have been a few close shaves. In March, a black quadcopter came within 200 feet of a flight arriving at John F. Kennedy International Airport. In August, a drone went haywire and careened into a group of people who had just emerged unscathed from outrunning live bulls. In a darker, sadder situation, a New York teen died after the propeller of his remote control helicopter "cut off the top of his head." And this month, a three-pounder fell from the sky, barely missing a man walking in Manhattan. 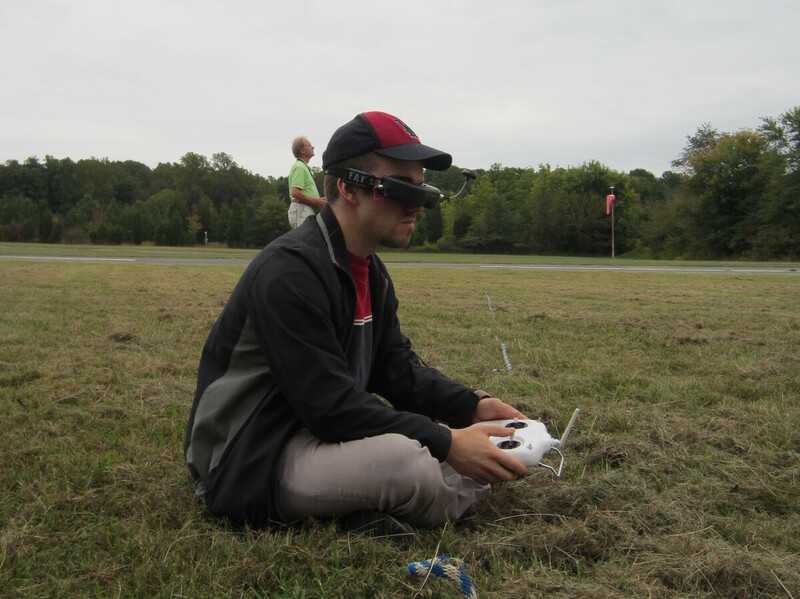 The DC Area Drone User Group organizes fly-ins and drone-building workshops. Just one year after it started, it has over 650 members. About 60 of them showed up — drones in hand — at a recent fly-in in Laytonsville, Md. The ability to operate a drone flying far beyond the range of human vision has brought up many privacy and safety concerns. Many of their drones look like bundles of circuit boards and wires strapped to metal frames, flanked by about four to 10 propellers. Some of them are even equipped with "first-person view" technology — mainly, a camera and a pair of electronic goggles — so that the flyer can see straight out of the drone's camera, as if they were riding on it, hundreds of feet in the air. "The drones we're talking about weren't here five years ago," says Gerald Richards, a longtime remote control pilot. Just years ago, he says, the copters would have cost tens of thousands of dollars. Now, small ones can be purchased online for about $100, like the one-ounce copter Richards flies around his living room to entertain his grandchildren. These days, you can do almost anything with drones — shoot stunning aerial photography, deliver medicine in places with bad roads, inspect offshore oil platforms, create 3-D maps of archaeological sites, herd sheep, deliver pizza and textbooks, map disasters like the Colorado floods, and even zoom around a taxidermied cat. A lot of municipalities don't quite know how to handle the personal flying robots operated by a growing number of amateurs, particularly when it comes to privacy issues. The Federal Aviation Administration is working on regulations for commercial drones that should go into effect by 2015, but the only rules that apply to drone hobbyists are the ones issued to model aircraft enthusiasts in 1981. They basically say: Don't fly too high, don't fly too close to an airport without alerting air traffic controllers, don't play chicken with a full-size airplane, and don't fly over people or hurt them. Right now, he says, all drones are lumped into the same category, from the little foam ones available at Wal-Mart to the 50-pound behemoths some people could choose to convert into flying weapons. Safety discussions have cropped up in other places as well. A website exists for people to report "fly away" incidents. People have proposed tweaking the safety code of the Academy of Model Aeronautics to apply to drones. Online forums host discussions about how to filter out glitches in software that might end up causing an aircraft to lose control. Some hobbyists are designing parachute systems that would deploy automatically, saving the equipment from impact, as well as the people that might be below it. This month, at a conference on drones and aerial robotics in New York, there was even talk of using radio-frequency "license plates" to alert people about what's flying in the air above them. A pre-flight safety checklist might include doing test runs with new equipment far from public spaces, making sure the batteries are fully powered, and putting the cost out of mind. Assembling a drone from scratch tends to add up to a minimum of about $500. Companies like intelligentUAS sell whoppers like this one, which goes for upwards of $7,000 — without batteries, camera gear and the latest autopilot system. According to Chris Anderson, sense-and-avoid technology is "the holy grail in our industry." That's when a drone detects obstacles and steers clear of them, saving the equipment — and the obstacle — from harm. "Someday, absolutely, all drones should have really good sense-and-avoid technology," he says. "But right now, they're of limited use and they're not perfect. It's sort of an unsolved technical problem." At least nine states have passed laws that restrict drone use by public agencies like policemen, or by individuals like hobbyists. According to Academy of Model Aeronautics officials, the FAA plans to release proposed rules for small unmanned aircraft by year end.